Do you want to channel your favorite character on your next visit to a Disney theme park? Then, Disneybounding is the way to go! 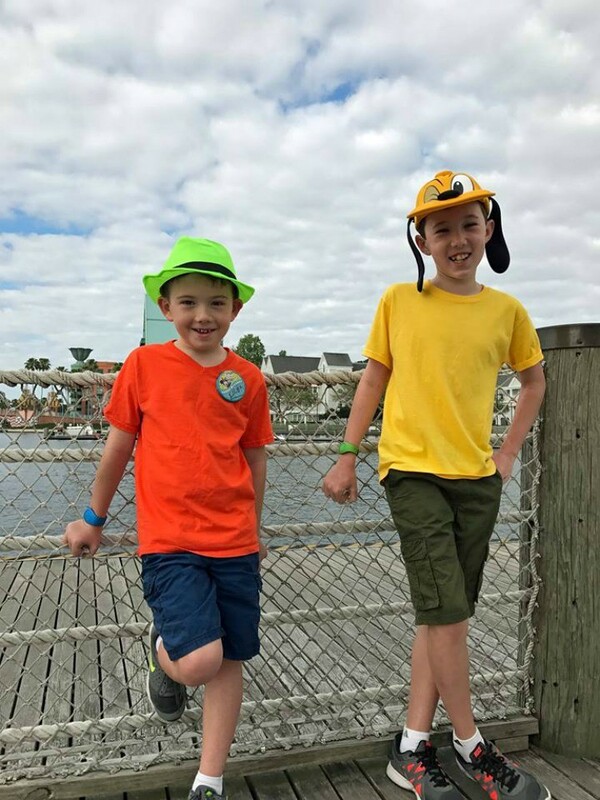 Not only is it a fun way to dress up when you’re in the parks, it’s easy to make it fun and affordable. Here are the most important things to know about Disneybounding. When my family and I visit a Disney theme park, we make it a good excuse to dress up. Personally, I like the idea of feeling like a Disney Princess without looking like I just came out of a Halloween costume store. And while I can be a blatant representation of a Disney character, I can be subtle, too. Here’s the scoop on how to Disneybound, costume ideas, and easy tips. 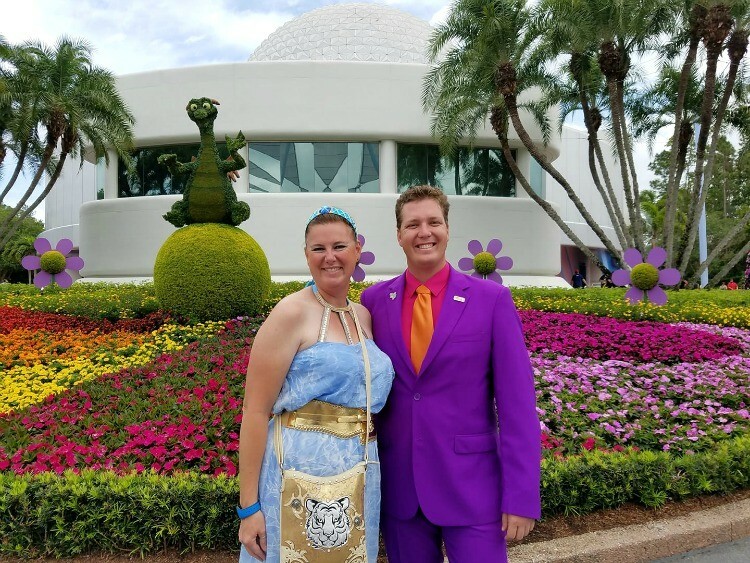 The famous Purple wall at Walt Disney World, Disneybounding on Dapper Day. 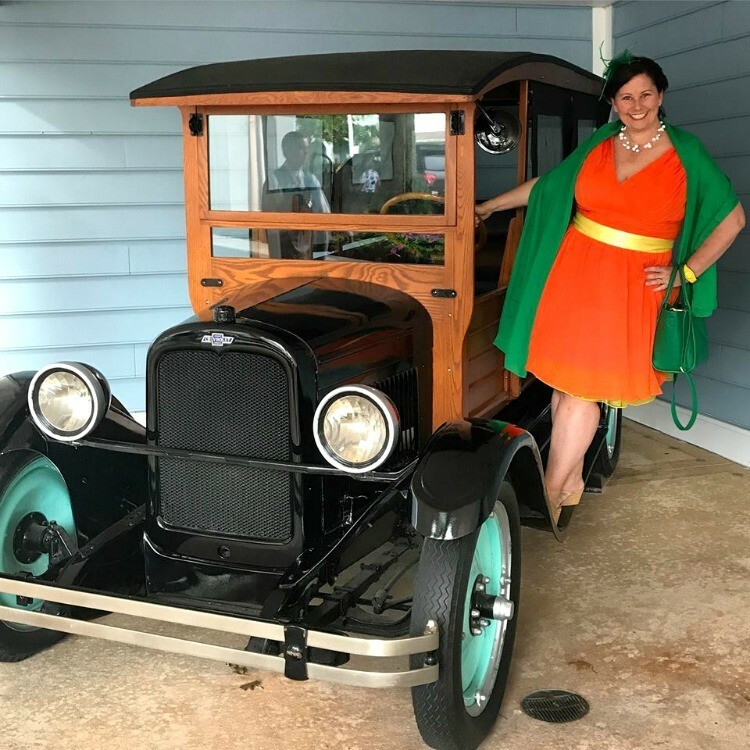 In a nutshell, Disneybounding is a way to play dress up without an actual costume. When you visit a Disney park, only guests under the age of 12 may wear costumes, and there are rules to follow even then. Taking a cue from clothing trends, tweens, teens, and adults use colors, patterns, and accessories to give homage to their face characters in a stylish way. Don’t think of it as cosplay; it’s not that extreme. First, choose a Disney character you want to fashion your outfit after. Next, head to your own closet. It doesn’t have to be an expensive habit, although you can let it be if you have the budget. Look for similar colors and prints that may work. For the icing on the cake, look for accessories that will really amp up your outfit. Again, these pieces don’t have cost and arm and a leg. My daughter loves all things “The Nightmare Before Christmas” so we had to get a little creative with her outfit on our last trip. Finding a silver pinstriped vest was impossible for us. Inspiration occurred, so instead I found a plain black one and painted on the stripes using fabric paint. Feel free to find inexpensive tennis shoes and decorate or paint them if you can’t find what you’re looking for. 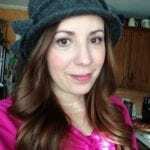 My best tip is to make sure you have a photo of the character when you head to the stores. Take cues from its overall theme (light blue for Cinderella, neon green for Mike W. from Monsters, Inc.) or go for a blatant representation. In my opinion, classic Disney characters are easier to pattern yourself after. Think plain-colored tops and bottoms like Mickey mouse or Goofy. Add a fun hat, a set of Mickey ears, and you’re golden. If you don’t want to head to the mall or deptartment store, Amazon is a good place to shop, too. Search for specific colors or patterns and narrow down your search. If you’re an Amazon Prime member, look for free shipping options to save even more money. 4. Going with a Group? Coordinate Disneybound Clothing. 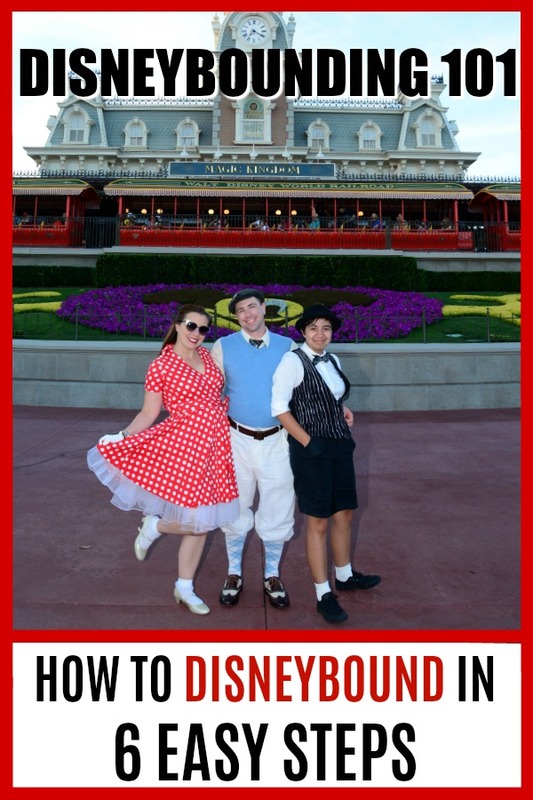 This is where Disneybounding can get really fun! If you’re visiting the theme parks with a group, think of movies that have several main characters and go with it. I’ve seen the Seven Dwarfs, Moana, and the evil step sisters from Cinderella done beautifully. If you have smaller children, there’s nothing cuter that letting them join in on the fun, too. 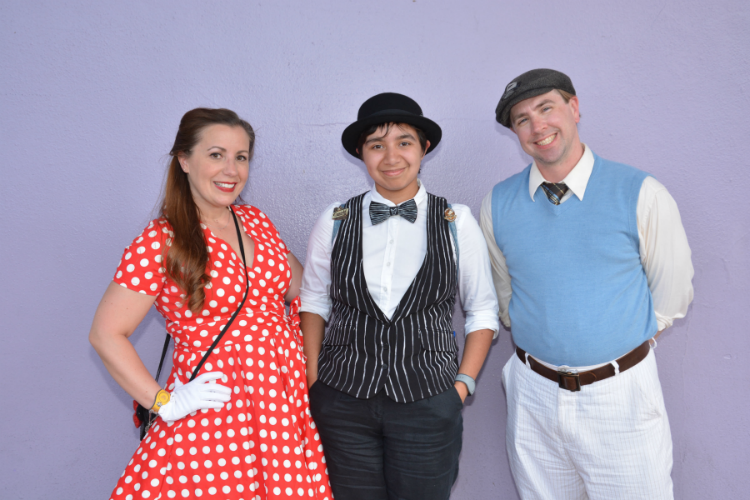 At both Disneyland and Walt Disney World, Dapper Day has become a retro-inspired way to dress as your favorite character. Each year, the festivities are getting bigger and better, and it’s a way to dress in your finest with a Disney flair. Again, here’s where I love shopping on Amazon for retro dresses (those are the keywords I search for). My go-to character of choice has been Minnie Mouse so I look for roackabilly-style dresses in red and white polka dots. Add a pair of Minnie Mouse ears, some fun shoes, and I’m good to go. As for my husband, he loves the style of the 1920’s and 1930’s, so on Dapper Day he pays tribute to the man himself, Walt Disney. We looked for knicker-style pants, argyle socks and tie, and a sweater vest. It’s seriously that simple. 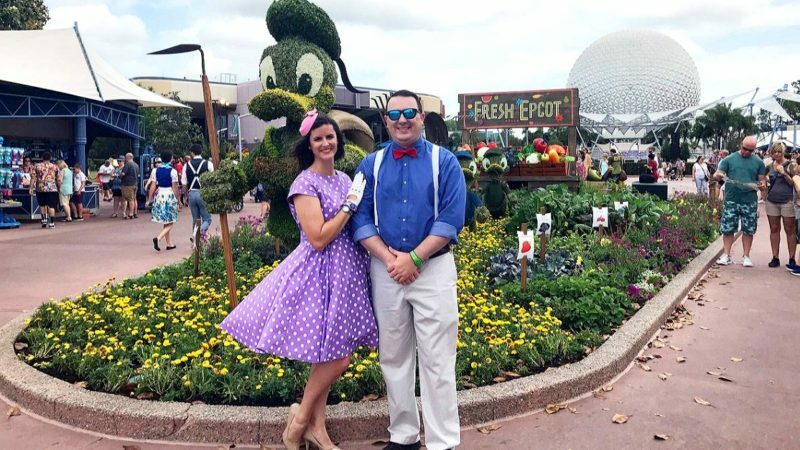 Finding your fave Disney character, and getting a photo with it, is a perfect way to show off your Disneybounding outfit! Photo Credit: Karen Heffren/Desert TravelingMom. Okay, so you’ve got your costumes, have the park tickets, and are ready to roll. 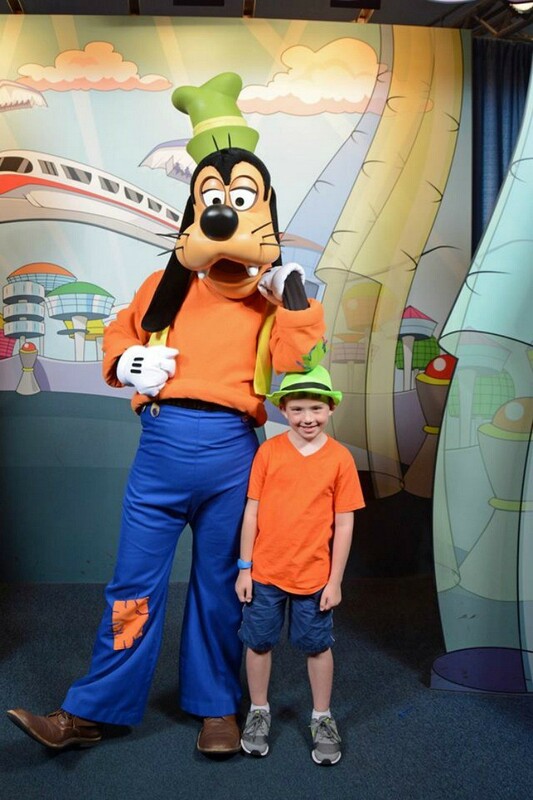 Once you hit the park, check the times guide to see if the character you’re Disneybounding as is doing meet and greets. If so, taking a photo or selfie with that character can be one of the best ways to show off your creativity. If you’re doing a subtle tribute, make sure you let that character know that you’ve chosen it – Disney characters love it when you show support.